Most people are quite familiar with the term “Achilles heel.” This is often used—sometimes in a lighthearted way—to describe someone’s “one” weakness. Now, Achilles from Greek mythology may have only been vulnerable in the back of his heel, but we are all human and no one really has only a single weakness! Ironically, the Achilles tendon is actually the strongest, most durable tendon in the human body. These connective tissues link bones and muscles together. In the case of the Achilles, it is the calf muscle and heel bone which are connected. This tendon is definitely strong, but—much like its namesake—is not completely invulnerable. In fact, there are different types of Achilles tendon injuries people can (and do) sustain. Achilles tendinitis. Tendinitis is a common overuse injury frequently seen when someone either increases training intensity or duration too quickly or participates in intense physical activity only occasionally (the proverbial “weekend warrior”). The pain is mild at first, but worsens during and after activity. Achilles tendon rupture. The Achilles tendon has a certain degree of flexibility, but when it is stretched beyond its means, it can tear (either partially or completely). We refer to this as a rupture, and it is quite painful. In addition to immediate pain, there is also often swelling, stiffness, and a loud snapping or popping noise when the injury occurs. Sever’s disease. This isn’t entirely an Achilles injury, but it is worth listing because of the tendon’s role in the condition. Sever’s is actually the leading cause of heel pain for adolescents. It happens when the heel bone grows at a faster rate than the Achilles tendon connecting to it. 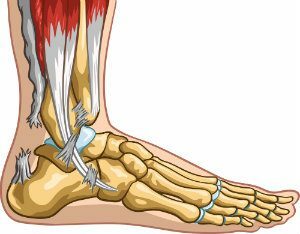 This puts strain on the tendon and causes pain in the back of the heel. The condition goes away in time, but we can provide treatment for the pain until the Achilles catches up growth-wise. If you need professional care for any of the types of Achilles tendon injuries, Dallas Podiatry Works can help. Our staff will diagnose the condition and then provide the effective treatment you need. Call our Dallas, TX office at (972) 566-7474 or our Plano office at (972) 943-3323, or request your appointment for either location online today.